If you plan to study in Japan for more than 3 months, you need to go to your local ward or city office and get your Japanese Health Insurance there. In order to do this, simply show your Residence card and passport, and fill out the forms. Medical expenses can be costly. Therefore, subscribing to the National Health Insurance is mandatory. The insurance premium has to be paid monthly or yearly once registration is completed. The premium varies depending on location and income. In most cases, the premium is about JPY 20,000 per year for foreign students in Japan. Once registered with the National Health Insurance, you will only need to pay 30% of your medical bills. Once you’ve registered, you will receive an insurance card. It will be renewed every year and a new card will be sent to your address. You do not need to do anything unless you have moved and need to inform your local ward of your change of address. As the insurance does not cover all medical expenses, for added peace of mind, you may subscribe to a private insurance. Most students, though, subscribe to the National Health Insurance only. 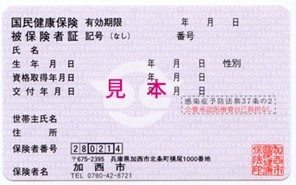 Japanese health insurance is mandatory if you intend to stay in Japan for more than 3 months. So do not forget it!